Hi, I am interested in your 1978 Chevrolet C/K Truck (stock #4615-CHA) listed on Autotrader for $17,995. I'd like to get more information about this vehicle and confirm its availability. 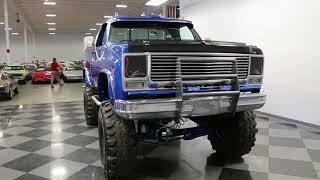 This 1978 Chevrolet K-10 Scottsdale 4x4 is everything you could want in a custom truck... and a hydraulic tilt bed! So you can look over all the details of this lifted and fully coordinated custom build, but you already know this is the baddest truck for the money out there right now. The investments in this Chevy went both for a cool attitude and added ability. Because while the bright blue paint looks nice, the colors that people will really complement you on is light blue and pink the coloring of the pinstripes. These artful touches run the length of the truck, are stylized elements around the cab and tailgate, and it even coordinates with Chevys famous Heartbeat motto on the sides of the bed. This is such a complete custom pinstriping package, that its even on the removable headlight covers. While the billet grille and upgraded rocker panels add some nice shine, your favorite bright elements are also what make this such a tough truck. This includes the brush guard with integrated lights, 15-inch wheels with Super Swamper tires, tubular step rails, and diamond plate rear bumper. More than just mean, this is a true workhorse thanks to liner paint in the bed, and a hydraulic lift for the tilt bed. Are you ready to impress plenty of people at the car and truck shows? Inside this is exactly how you want a truck like this to be. Its a clean setup with exterior-matching blue on the doors, handles, and lower dash. A wood-like appearance on the dash gives this custom a nice look. But more than just look good, its also is built correctly. Thats why the durable vinyl bench seat has comfortable cloth inserts for where you sit. The full gauge panel is upgraded with an auxiliary readout trio and a large Sunpro tach on the dash. Plus, with the AM/FM/CD stereo, sunroof, and sliding rear window, this is the perfect pickup to crank up the tunes and let the wind whip through the cab. One look in the engine bay, and you know there was a ton spent on the presentation alone. The brake booster, master cylinder, steering rod, and much more look great as the exterior-matching blue radiate from within the engine bay. This full color coordination with the interior and exterior lets you know this is a thoughtful custom build. Plus, the 350 cubic-inch V8 that has been upgraded for extra power. The headers added even more power as they contribute to the rumble of the dual exhaust. As you look at the undercarriage photos, you see more of this great color matching as the shackles, transmission, two-speed transfer case, hubs, shocks, and much more it really makes this a full custom build. While its almost too pretty to take out into nature, the beefy four-speed manual transmission, dual fuel tanks, power steering, front disc brakes, and lifted 4x4 stance means this is also one of the most capable off-roaders around. Complete with owners manual, this is the perfect combination of real ability mixed and monster truck showmanship. Its a terrific custom truck thats available right now at quite a nice price. Call now!